We are currently accepting gently used/new backpacks, luggage sets, and suitcases for homeless youth so that as they travel to school, work, home, and other places, they will not have to use plastic bags for belongings. This drive will take place November 1-December 31, 2016. 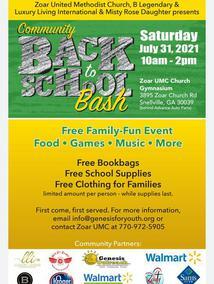 To make a donation/pickup, please call 678-437-2024. At Genesis Outreach, Inc, we are proud to keep you informed on what's happening at our agency, as well as testimonials from old and new clients. "I'm doing great things because of Genesis Outreach!" "In High School I was a part of the National Honor Society, National Beta Club and graduated in the top 10% of my class. I am currently attending Atlanta Metro College as a Criminal Justice major and have been inducted into Phi Theta Kappa and on the Dean's List. Thanks to the staff of Genesis Outreach for assisting through HS and now, college and for believing in me. I'm doing great things because of Genesis Outreach!" "I contacted Genesis Outreach because I was homeless and need of housing and they never judged me. They asked if I was in a safe location and that they would find an agency in my area that will be able to help me get on my feet. Dr. Howze called back and told me where to report to for assistance. One year later, I am doing well. Got a job, my own place, and now ready to roll up my sleeves and give back to Genesis Outreach what they gave to me." Genesis Outreach, Inc is dedicated to saving the lives of youth. "I have been calling on Genesis Outreach for a couple of years. They helped me with housing, provided me with food and clothes, and helped me get a job. Even when I got into a little trouble, they never left me. I thank them for being like my family." "Now I'm able to give back"
"Genesis Outreach was there for me during my teenage years where I was involved in the Juvenile Justice System and had given up on life. They provided me with counseling and supportive services to help me. Today, I am currently working with the justice system and now I'm able to give back to kids." Mark your calendars for Thursday, November, 17, 2016 for GA National Gives Day. We are appreciate your monetary donations that allows us to be able to continue to serve the youth and families in our community. Share this information with your friends, family, and co-workers. Our goal is $5,000. We are currently gearing up for Thanksgiving and Christmas Holidays. We will be accepting donations for non-perishables food and gift cards to go towards the purchase of a ham/turkey for Thanksgiving Nov 1-Nov 20, 2016. Our goal is to provide 30 families with complete meal packages. We proud to announce that we were selected by Toys for Tots this year to be a distributor of toys. We are partnering with our local schools and daycare centers. We are accepting donations for toys, clothing, gift cards, hygiene products, school supplies, and other items that can be enjoyed by ages birth-18 years of age. Our goal is to provide Christmas for 250 youth to include those that are in group homes that have little to no support from outside persons. If your church group, organization, or business would like to donate or will allow us to set up a box inside of your business for donations, please contact us. All donations are tax deductible. If you would like more information on how you can help, please contact us at info@genesisforyouth.org.